Using brain science to drive successful learning transfer. By Carol Leaman, CEO, Axonify Inc.
Learning transfer can be defined as the ability of a learner to successfully apply the behavior, knowledge, and skills acquired in a learning event to the job, with a resulting improvement in job performance. Training & Development professionals increasingly are on the hook to prove the value of training. 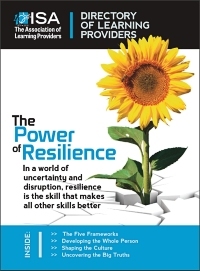 But they’re caught in a predicament: In many organizations, they have little or no control over the learning process once the employee leaves the classroom (or finishes the e-course), and it’s impossible to measure the outcomes. While the training might be top-notch and feedback great in the classroom, if people can’t apply what they learn on the job, then the training has failed. Identify business outcomes and learning goals for the learning event. Design the training to support learning transfer, including practice activities, role modeling, discussions, content reviews, etc. Make the training relevant for learners, and employ tactics to engage them. Provide practice time with immediate feedback. Use methods that will make the learning more memorable. Provide job aids and performance support systems. Create an environment that allows time to practice new skills. Engage managers and peers in coaching, evaluation, and feedback. Provide refresher and summary material to enhance recall of the learning. The problem isn’t the training; it’s what comes afterward. Of the three stages, the biggest challenge for most organizations is what happens after the training. With training still seen as an isolated event, supervisors and even learners are slow to accept responsibility for creating an ideal environment for learning transfer. In today’s competitive world, businesses want employees back on the job after training, not participating in team practice and evaluation sessions with supervisors and peers. And putting employees back into a training room for more training is expensive. That leaves many organizations creating job aids and hoping for the best. So what tools are available to T&D professionals to maximize value from the learning event? Recent advances in brain science have proven that if the learning can be continued consistently and is ongoing after the initial training, the employee will retain significantly more of the information to apply effectively to the job when it’s needed. 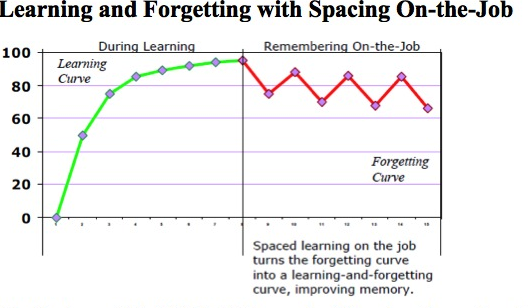 In his 2006 work, “Spacing Learning Events Over Time: What the Research Says,” Will Thalheimer identifies that although learning and memory is strong during a training event, knowledge is rapidly forgotten afterwards. Interval reinforcement solutions now are available that provide spaced repetition learning as both a pre-training and post-training intervention. Typically, they use brain science concepts that many T&D professionals already are employing, such as “chunking” (bite-sized modules). 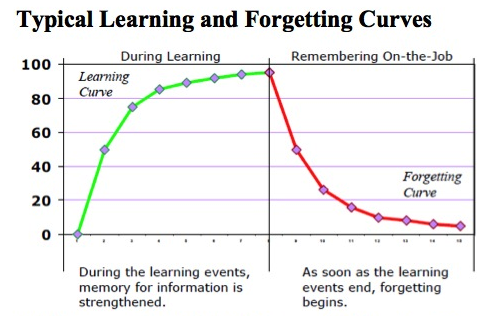 They also may apply “active recall” (testing) to enhance retention of the knowledge even further. Interval reinforcement generally is being implemented through purpose-built software applications. Some deliver the information via daily e-mails, while others have sophisticated interfaces that also incorporate game mechanics to amplify employee engagement in the learning. It usually takes only a few minutes each day, minimizing job impact. It greatly enhances knowledge retention, increasing the long-term effectiveness of training and reducing the need for retraining. It keeps responsibility and control of the learning in the hands of T&D professionals, who can drive a continuous learning environment. It removes responsibility for ongoing training from the employee’s supervisors or peers. Interval reinforcement can be implemented as an ongoing program, allowing organizations to deliver information and knowledge consistently, while also monitoring employee knowledge levels. In conjunction with job performance metrics, it can provide powerful intelligence regarding the effectiveness of training, and how much of the learning is applied appropriately to the job. By implementing a consistent post-training interval reinforcement program of learning, organizations can continue the learning process until an employee must draw on the knowledge for the job. And because T&D professionals drive that process, it allows them to ensure that training is designed, delivered, and reinforced for effective learning transfer. Carol Leaman is the CEO of Axonify Inc., a next-generation e-learning company that combines game mechanics with brain science to drive knowledge retention in corporate enterprise. Prior to Axonify, Leaman was the CEO of PostRank Inc., a social engagement analytics company that she sold to Google in June 2011. She was also the CEO of RSS Solutions Inc. and Fakespace, two companies she sold to strategic acquirers. Leaman is also the recipient of the Sara Kirke Award (2010) for Canada’s leading female entrepreneur and the Waterloo Region Entrepreneur Hall of Fame Intrepid Award (2011). She has presented at events such as the Fortune Tech conference in Aspen, HR Summit 2012, Impact99 conferences in both Vancouver and Toronto, and TedxWomen in Waterloo.